Temperatures are unlikely to peak above 100 degrees…it’s Fall in Arizona! Time to break up the semester by visiting cooler climes before they get cold, or enjoy a few less than blistering days here before afternoons become truly lovely this winter. Reference Librarians will keep regular hours during Fall Break, because they are regular people. They are here to help you between 8:30 am and 5:00 pm, Monday – Friday. This entry was posted in Uncategorized on September 30, 2015 by Mari Bigler. Come celebrate Constitution Day at ASU Libraries Constitution Day Celebration on September 17th from 12 Noon to 1 PM in Hayden Library Room 133. The event will feature Dr. Owen Anderson, Associate Professor of Philosophy and Religious studies in ASU’s New College. In 2013-2014 he was the William E. Simon research fellow in the James Madison Program at Princeton University and a visiting scholar at Princeton Seminary. He has published seven books including The Declaration of Independence and God (2015) and The Natural Moral Law (2013) with Cambridge University Press. His areas of research include epistemology, the ethics of belief, intellectual history, and religious pluralism. He regularly teaches Philosophy of Religion, Introduction to Philosophy, Applied Ethics, World Religions, Western Religious Traditions, and Religion in America. 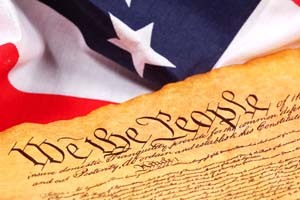 The Declaration of Independence famously states “We hold these truths to be self-evident, that all men are created equal, that they are endowed by their Creator with certain unalienable Rights, that among these are Life, Liberty and the pursuit of Happiness.” This claim relates human rights and equality to the role of the Creator. As such it is affirming a relationship between human origins and human nature. This talk will look at some of the influence this has had on American thought, including religious freedom and state established religion. This entry was posted in Uncategorized on September 9, 2015 by Leslie Pardo.